Ellie Bamber stands out in Teen Vogue‘s Future Icons feature. Featured as one of the many young trailblazers to watch by the glossy, the British actress opened up about her next film, called Taipei. The feature also includes musicians Alma, Madison Beer, Kelsey Lu, Chloe x Halle, and Kacy Hill, athlete Chloe Kim, actors Alisha Boe, Cameron Dallas, Kaitlyn Dever, Kelvin Harrison Jr., Jaeden Lieberher, Sophia Lillis, Ashton Sanders, China Anne McClain, Storm Reid, Odessa Young, Harris Dickinson, and Ekaterina Samsonov; models Helium Aden, Paloma Elsesser, Barbie Ferreira, Winnie Harlow and Selah Marley; art curator Kimberly Drew, and writer Tyler Ford. Ross Lynch poses for a photo with girlfriend Courtney Eaton while attending the 2017 Variety Power of Young Hollywood event on Tuesday night (August 8) at TAO Hollywood in Los Angeles. The 21-year-old actor, who will soon be seen in the movie My Friend Dahmer, was also joined by his R5 bandmates Riker Lynch, Rydel Lynch, Rocky Lynch, and Ellington Ratliff. Style star Yara Shahidi was looking chic in a matching top and pants and Kelli Berglund rocked a blazer dress. Sofia Carson was seen hanging out with Peyton List and her brother Spencer. Sofia‘s Descendants 2 co-stars Cameron Boyce and China Anne McClain were at the party and Cameron and Peyton grabbed a group photo with Bunk’d co-star Karan Brar. Skai Jackson was there too! Danielle Campbell spent time with Riverdale‘s Madelaine Petsch, whose boyfriend Travis Mills joined her for the event. Another music star who stopped by was Fifth Harmony‘s Normani Kordei. There were a bunch of social media influencers and YouTube stars in attendance, including, Jake Paul, Amanda Steele, Baby Ariel, Bethany Mota, Jacob Sartorious, James Charles, Jordyn Jones, and more! FYI: Yara is wearing a Philosophy di Lorenzo Serafini top and pants. Skai is wearing an H&M dress and Stuart Weitzman shoes. Amanda is wearing an Alessandra Rich x FWRD dress, Nicholas Kirkwood shoes, and an Edie Parker clutch. Kelli is wearing Nissa jewelry and carrying a Vince Camuto clutch. Peyton is wearing a Petersyn top, a Milly skirt, Sophia Webster shoes, an Edie Parker clutch, and Lana jewelry. Disney's 'Descendants 2' - Full Cast & Songs List! 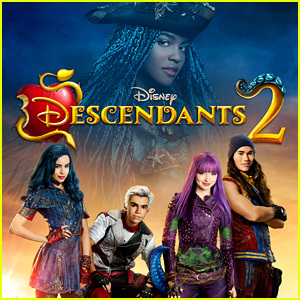 The new movie Descendants 2 will be premiering tonight and it’s not only airing on Disney Channel… it will air on ABC, Freeform, Lifetime, and more! Dove Cameron, Sofia Carson, Cameron Boyce, and Booboo Stewart are reprising their roles in the sequel to their smash hit Disney Channel Original Movie. 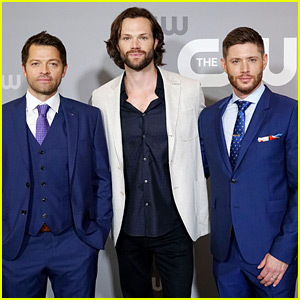 The film follows the children of some of the fan favorite villains from Disney movies, including Maleficent, the Evil Queen, Cruella de Vil, and Jafar. Six original songs were written by Teen Beach Movie and High School Musical composer Daniel Lawrence. 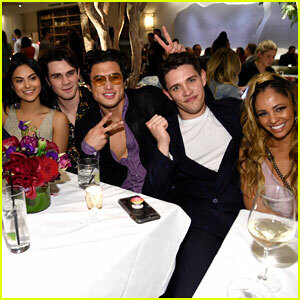 New cast members include Thomas Doherty, who is currently dating Dove, and China Anne McClain! Make sure to tune in for Descendants 2 tonight at 8/7c on Disney Channel, ABC, and more.